Moles are common. Almost everyone has a few and some people develop hundreds. Individuals with light skin tend to have more moles, with the average ranging from 10-40. Probably the single most important thing to know about moles is that melanoma, the deadliest form of skin cancer, can develop in or near a mole. 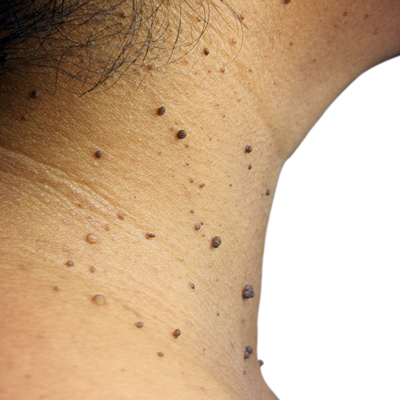 Some types of moles increase the risk of developing skin cancer. Performing regular skin self-exams helps people recognize the early warning signs of melanoma. We recommend that everyone perform regular skin self-exams. Here’s what to look for when performing our self-exam. When a person is born with a mole, that mole is called a congenital nevus. These moles vary in size from small to large/giant. The large/giant congenital mole (greater than 20 centimeters) has been shown to carry a higher risk of developing melanoma. Children born with small birthmark moles should have yearly skin examinations performed by a dermatologist to evaluate for any unusual changes. Babies born with larger congenital nevi may require further imaging studies to determine the extent of the mole and surgical removal may be advisable. Also called a dysplastic nevus, these moles are generally larger than average, (bigger than a pencil eraser) and irregular in shape. They tend to have uneven color with mixtures of tan, brown, red and pink. Atypical moles may run in families, but anyone may develop these moles. People with atypical moles may have an increased risk of developing melanoma. Moles that appear after birth are called acquired moles and generally are not a cause for concern unless they appear after the age of 30. People who have more than 50 to 100 acquired moles, however, have a greater chance of developing melanoma than those with fewer moles and should have yearly skin examinations by their dermatologist. Seborrheic keratoses, the most common type of bumps seen, are harmless spots that pop up as we age. SK spots can be flat or raised with a color that is your normal skin tone or darker. Over time, they may get bigger and become raised and waxy in texture. They are non-cancerous and generally don’t cause any pain or discomfort. The FDA-approved treatment for SK is ESKATA.